Someone left a bunch of this stuff at our house and now I am completely addicted. I think this was part of a secret conspiracy and the person has stock in this company and, knowing my love of bubbly beverages, thought they could improve the stock value. Definitely better for you than Diet Coke, but oh so much more expensive. I need to find an alternative. Any suggestions? That stuff is the curse of my trips to Italy. I despise the stuff, but it's on every dinner table that you sit down to. Stopping by from the TOS Homeschool Crew Blog Walk! Yes dude yes! Stick with it! So much better for you than Diet Coke it's worth the money!!! Seriously, my husbands twin has been in and out of the hospital with kidney probs stemming from a lack of water drinking and a lifetime of inhaling coke like air. 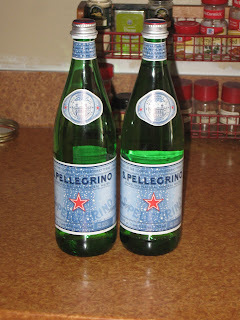 Jessica, my hubby and I were also addicted to San Pelligrino until we were forced to find a cheaper alternative- try lemonlime seltzer water that is Giant Eagle brand. Not the sweetened kind, it's just seltzer with a hit of flavoring. It's not as good, but better than going broke over fuzzy water! You know I have never had that. I'll have to try it one day. Stopping by from the crew on the blog walk! We are addicted to our store brand sparklers. I love the grapefruit flavored one. And sometimes when I have a friend over I'll make Italian soda with a plain soda water, a little caramel syrup (or whatever flavor) and a splash of creaaaaam! So delicious and would cost you $4 at starbucks. Calistoga brand sparkling mineral water is great...I just don't know how the prices compare. It's out of Napa in California.